“To our knowledge, we are the first to present an image sensor that is fully transparent – no integrated microstructures, such as circuits – and is flexible and scalable at the same time,” says Oliver Bimber of the Johannes Kepler University Linz in Austria, co-author of the Optics Express paper. For the luminescent concentrator to work as an imager, Bimber and his colleagues had to determine precisely where light was falling across the entire surface of the film. This was the major technical challenge because the polymer sheet cannot be divided into individual pixels like the CCD camera inside a smartphone. Instead, fluorescent light from all points across its surface travels to all the edge sensors. Calculating where each bit of light entered the imager would be like determining where along a subway line a passenger got on after the train reached its final destination and all the passengers exited at once. The solution came from the phenomenon of light attenuation, or dimming, as it travels through the polymer. The longer it travels, the dimmer it becomes. So by measuring the relative brightness of light reaching the sensor array, it was possible to calculate where the light entered the film. This same principle has already been employed in an input device that tracks the location of a single laser point on a screen. The researchers were able to scale up this basic principle by measuring how much light arrives from every direction at each position on the image sensor at the film’s edge. They could then reconstruct the image by using a technique similar to X-ray computed tomography, more commonly known as a CT scan. Currently, the resolution from this image sensor is low (32x32 pixels with the first prototypes). The main reason for this is the limited signal-to-noise ratio of the low-cost photodiodes being used. The researchers are planning better prototypes that cool the photodiodes to achieve a higher signal-to-noise ratio. The main application the researchers envision for this new technology is in touch-free, transparent user interfaces that could seamlessly overlay a television or other display technology. This would give computer operators or video-game players full gesture control without the need for cameras or other external motion-tracking devices. The polymer sheet could also be wrapped around objects to provide them with sensor capabilities. 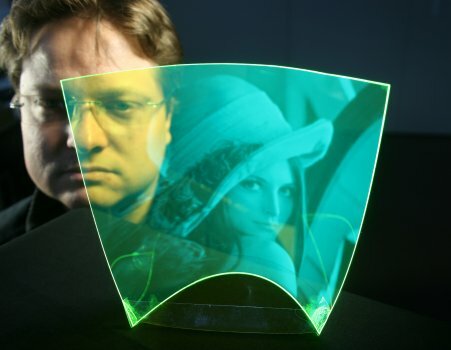 Since the material is transparent, it’s also possible to use multiple layers that each fluoresce at different wavelengths to capture color images. The researchers also are considering attaching their new sensor in front of a regular, high-resolution CCD sensor. This would allow recording of two images at the same time at two different exposures. “Combining both would give us a high-resolution image with less overexposed or underexposed regions if scenes with a high dynamic range or contrast are captured,” Bimber speculates. He also notes that the polymer sheet portion of the device is relatively inexpensive and therefore disposable. “I think there are many applications for this sensor that we are not yet aware of,” he concludes.